Paul, wonderful piece, as your historical writing always is. And it has to be realized that the weapons are different but the war is the same. Every war has its stages and changes of strategy, sometimes so radical that the underlying theme can't be recognized by some. But as you say, it doesn't become non-religious just because we want it to be non-religious. All the valour and sacrifice that men of old, leaders such as Charles Martell, Valletta, Jan Sobieski did in protecting Europe from the 1000 year continuous war by Islam, has been set at naught, and Europe is being handed over to our enemy. What a catastrophe. At this critical juncture, we have lost much of our faith, and what goes with it - hope. A people that has no faith will find it hard to summon the will, and the courage that is necessary to repulse an ideology that is based on the Allah driven command of Jihad. The great and crucial victories of Charles Martell, Valletta and Jan Sobieski, in the face of overwhelming odds and fanaticism, were achieved by a sustaining faith. We ignore the lessons of history at our peril. Ernle Bradford's The Siege is a compelling book, and I must have read it several times in a week. Highly recommend it. PS: Came across your site via VFR. I'm glad I did so. What I have noticed on another thread here (the long one called Global Warming and the Jihad) is that one of our liberal commentators was incredulous, not to say contemptuous, at the idea that anything might be legitimately objectionable in the Islamicization of culture, at least when the specific example in question was of something not intrinsically violent. Heaven knows there are worse things that will come in an Islamicized culture in the long run than McDonald's advertising that all its meat is "halal" or Muslim religious ritual bathing facilities as permanent fixtures in all our public restrooms. But it's interesting that to the liberal mind you have to be some sort of kook to say, "This _isn't_ a Muslim country, and I don't want our public physical life to be, as it were, tipping its hat to the worship of Allah in my face every time I turn around. I don't want it to _become_, even in that sense, a Muslim country." I am sorry to disappoint you Mr Paul J Cella but La Valette's victory, or rather the Great Siege of Malta ended on September 8, 1565. Feast Day of the Nativity of Our Lady - not September 11 ! However, the resonance which you are trying to discover might exist with the fact that on that very day (September 8, 1565) North America had its first Catholic settlement established - way before the arrival of the Protestant Mayflower!! The Ottoman Sultan Mehmet II was succeeded by his son Bajazet, who in turn was succeeded by Selim the Grim. The latter annexed Egypt, enlarged the Ottoman Empire and at the time of his death, was planning mischief upon Rhodes and subdue once and for all what he referred to as the: “Christian nest of vipers.” The Sultan died and was succeeded by his son, ‘Suleiman the Lawgiver’ or ‘Suleiman the Magnificent,’ as he would later be remembered. Like Mehmet his predecessor, Suleiman was adept in the arts of war, an exceptional statesman, a poet and a man of culture. He was considered to be the Grande Porte, Allah’s deputy on Earth, Lord of Lords of this World, Possessor of Men’s Necks, King of Believers and Unbelievers, King of Kings, Emperor of the East and West and another few hundred titles. In 1521, Philippe Villiers de L’Isle Adam was ordained Grandmaster and employing the most able military engineers of his time fortified Rhodes as best as he could. A mysterious event recorded by the Order’s historians and evidently an ill omen, occurred to L’Isle Adam whilst travelling from France to Rhodes. Whilst sailing through the Maltese Channel, Philippe’s galley or carrack, was struck by lightening. In the incident a number of his company were killed and his sword was reduced to ashes. This was later interpreted as a portent of the future events, occurring in the Mediterranean Sea (1522-1571). Leaving Rhodes, together with L’Isle Adam, was a young Provincial named Jean Parisot de la Valette. From 1523 to 1530 the Military Knights Hospitaller of Jerusalem and of Rhodes, resided in Rome and were searching for a new home. Their chance came when in Bologna, Italy; Pope Clement VII crowned Charles V of Spain as Emperor. The Emperor inherited the Maltese Archipelago within which the Knights were interested. Charles and his advisers seemed likely interested in the possibility of placing the Knights in Malta. Malta offered a good defense against the Ottoman and the North African corsairs. This move provided further protection to the Emperor’s dominions in Sicily and therefore also the Papal States. Charles V gave his consent, asking in return for a yearly nominal rent of one falcon, thus the famous ‘Maltese Falcon.’ In actual fact the Maltese Falcon is a species of Peregrine Falcon. In 1530, the Knights arrived in Malta and were initially disappointed for the barren state of the Island. One point in favor was the natural harbors it provided, which could comfortably fit the largest fleet. One of the ‘tongues’ of land or peninsulas, was in the following years transformed into the city of the Knights with fortifications, forts, a church dedicated to Saint Lawrence and a town called ‘the Birgu.’ The largest peninsula of land, was called Mount Sciberras and it was from here that the Turks would conduct most of their bombardment upon the Birgu in 1565. To protect the safety of mercantile shipping, the Knights attacked Mahdia, a port between Tunis and Tripoli in the Gulf of Gabes. It was a cove of corsairs and was taken successfully by the Knights. Dragut or Torghoud Rais, the most dangerous Barbary corsair to have ever sailed the Mediterranean Sea, an early prototype of Bin Laden who was also financed or rather conducted business with fallen-away Christian and Jewish merchants, swore to avenge himself of the fall of Mahdia. In July 1551, he sailed to Malta bent on laying waste the whole Island. To his surprise the corsair discovered that the two towns set up by the Knights were too well protected for a siege, so he moved North to lay siege to the old fortified town of Mdina. Here the miraculous intercession of Saint Agatha saved the town folk. Dragut abandoned the invasion of Malta and laid waste Gozo, Malta’s sister Island and mythical home of Calypso, taking into slavery its entire population of 5,000 inhabitants. The Sultan Suleiman the Magnificent, was in his declining years and was pierced with grief for having left the Knights set sail free from Rhodes in 1521/22. The lamentations and exhortations of his courtiers and the Imam, to free the captured Islamists from the slavery they endured in Malta and insulted by the capture of his favorite concubine by the Knights while she was crossing the Mediterranean on one of his ships, instigated his plans to devastate the Islands. In 1564, his war machine was being assembled. With Malta under Ottoman rule, the Sultan could well use it as a base for an audacious European attack through Italy, maybe with some luck also getting rid of the hateful religion of Catholicism altogether, by devastating Rome. But for now he had to capture Malta and rout those whom he called: “Son’s of dogs,” the Knights of the Blessed Virgin and Saint John. Through the Sicilian Viceroy Don Garcia, Philip II warned La Valette of the imminent attack, however, Don Garcia was not quick at aiding Malta, for he was to defend Sicily in case Malta fell to the Ottoman mace. As the siege progressed, a third peninsula of land called Senglea, was seemingly conquered and had fallen to the enemy, when unexpectedly a trumpet sounded, calling for a retreat. The troops were ordered back by their officers and under-officers, as news arrived that their camps and wounded were being attacked by the cavalry from Mdina. However, the Grandmaster had an iron grip on the Maltese population for a small faction was indeed, planning to open the gates to the enemy. As a general rule such internal intrigues are always present during a siege. Finally, the Spanish Viceroy in Sicily Don Garcia’s ‘grand succor’ arrived and landed in Malta, bringing a force of 8,000 Spanish, Italian and Sicilian men. On learning about this matter the Pasha, believing that a much larger force had landed, ordered his army to abandon the Island, but on realizing his mistake he reordered his battle weary troops to invade the north of Malta. The new force comprised of fresh soldiers who cut through the Ottoman troops and forced them to retreat. Less than a third of the entire Ottoman army sailed back to Istanbul, the Sultan suffered his greatest defeat to date. Suleiman exclaimed: “I see now that it is only in my own hand that my sword is invincible.” The following year the Ottoman Sultan was preparing for a larger force to set sail for Malta. However, La Valette’s spies destroyed the grand arsenal of Istanbul by fire, this prevented the Sultan from undertaking another siege. The Lord of Believers and Unbelievers died of apoplexy during his invasion of Hungary, the decline of power of the Sultanate followed, accelerated by the defeat of the Islamic Armada at the Battle of Lepanto in 1571. The Knight Fra' Francesco Balbi described the lifting of the siege in the following manner: “It has pleased God this year, 1565 that under the good government of the brave and devout Grandmaster Jean de la Valette, the Order should be attacked in great force by the Sultan Suleiman…. And it had equally pleased God, as most of the islanders believed, through the intervention of the Blessed Virgin Mary, that after four months of terrible hardship, that same large Turkish army was forced to abandon the island, defeated in its task. How, if not so, could then one explain the arrival of the Spanish force and the lifting of siege on September 8, the day of the Feast of the Nativity of Our Lady… I do not believe that music ever consoled the human senses, as did the peal of our bells on September 8, 1565, which was the Nativity of our Lady. For the Grandmaster of the Hospital ordered them all to be rung at the very time when the call to arms was usually sounded, and for three months we had heard them sounding only the call to arms. That morning they called us to Mass, and a pontifical high Mass was sung very early, thanking the Lord our God and his Blessed Mother for the mercies that they had bestowed upon us.” The Maltese firmly believed that their Madonna had helped them achieve victory. The Dominican Michele Fontana delivered a sermon in Sicily, in which he stated that when the Turks were attacking Malta, the Catholics saw the Virgin Mary exiting the Church of the Annunciation dressed as a warrior, wearing a helmet, armor and holding a drawn sword in her right hand, flying through the air like a white cloud, killing and frightening the enemy wherever she went. The Order’s historian Bosio, states that the Islamists saw Our Lady, Saint John the Baptist, and Saint Lawrence followed by numerous angels, protecting the walls of Birgu and mistook these for Catholic reinforcements, becoming so frightened that they retired. The Great Siege of Malta commenced on May 18, 1565. It ended one hundred and fourteen days later on September 8, 1565, the solemnity of the Nativity of the Blessed Virgin Mary and later also dedicated to ‘Our Lady of Victory’ in Malta and ‘Our Lady of the Holy Rosary.’ 70,000 cannon balls rained down on Maltese fortifications and houses in four months of siege. Many Catholic Knights received holy martyrdom during the Great Siege, these included La Valette’s nephew Francis de La Valette Parisot, Annibale and Rosso Strozzi, Francesco Lanfreducci, Vespasianus Malaspina the cousin of Knight Ippolito Malaspina, the Papal Fleet Admiral and cousin of Lepanto hero Mark Antonio Colonna, Asdrubale de Medici, Johannes de Pamplona, and many others. On receiving the joyous news of the victory, the Pope in Rome ordered a procession of thanksgiving to be carried out from Santa Maria Maggiore to San Giovanni in Laterano and also ordered for the cannons of Saint Angelo to perform a military salute, as occurred during the occasion of his coronation. The Romans not knowing really where Malta was, jubilantly joined in the festivities. 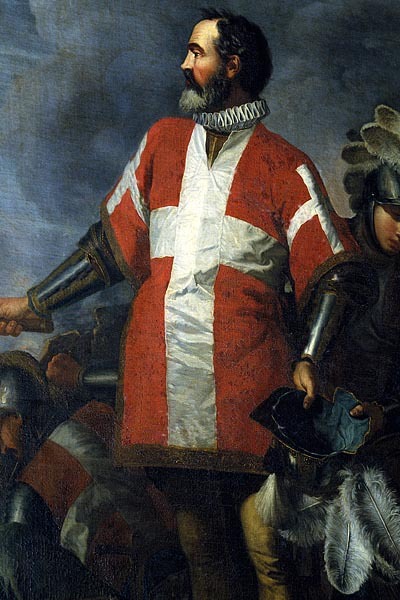 La Valette was offered a Cardinal’s hat, which he declined as he maintained that the Grandmaster of the Knights Hospitallers must engage in military action, which is unsuitable for a cardinal. He suffered a stroke whilst hunting and died shortly afterwards. Unfortunately La Valette himself would not witness the city named after him which was financed by most of the European Monarchs after learning of this Christian victory. The first stone laid for the building of Valletta was placed as a foundation stone for the Church of Our Lady of Victory. When the City of Valletta was built the Icon of Our Lady of Damascus was together with the Icon of Eleimonitria, placed in the Greek Catholic Church. Two hundred years later in 1798, the Icon was not included amongst the ‘Maltese Relics’ given by the last Grandmaster Von Hompesch to the Czar of Russia. The relic of Blessed Gerard of Tonque can be venerated at the church adjoining the convent of the cloistered nuns of Saint Ursola, Valletta, Malta. La Valette and the fallen Knights are buried at Saint John Co-Cathedral, Valletta, Malta the City of the Knights of the Blessed Virgin and Saint John the Baptist. Today, the miraculous Icon of Damascus can be viewed in the Greek Catholic Church in Valletta, Malta. The sword and Cardinal’s hat of La Valette can be viewed at the Oratory of Saint Joseph in Birgu, Malta, the gold sword and gem encrusted poniard at the Louvres in France, while the Icon of the Blessed Virgin of Philermos at Cetinje Museum in Montenegro. When the Knights emigrated from Cyprus to Rhodes, upon the Island, south west of the town of Trianda and upon a hill named Ialisos, they discovered the Chapel of Our Lady of Philermos. The ancient story associated with this chapel, was of a man who in his despair had ascended the hill to commit suicide at the ruins of the Phoenician temple of the sun. Our Lady appeared and with her gentle smile convinced the man otherwise and he repented. The temple ruins of the sun god were cleared and in its stead, a chapel dedicated to Our Lady was erected in remembrance of the event. Within the chapel a miraculous Icon said to have originated from Jerusalem, was placed. The Icon of Our Lady of Philermos was therefore placed upon the site which once was a solar temple. Coincidentally, the feast day dedicated to the Order’s founder, Blessed Gerard, occurs on October 13, the day commemorating the last apparition of Our Lady at Fatima and the day of the solar miracle. Our Lady replaces our despair with hope. In 1602, a squadron of galleys belonging to the Hospital, raided the Ottoman fortresses of Mahometta, Lepanto and Passava. The raids acquired much grain for Malta. The captured forts’ keys were hung on the wall of the Chapel of Our Lady of Philermos; two silver plaques commemorate the event and can still be seen in the Chapel at the Co-Cathedral of Saint John in Valletta, Malta. The silver plaques placed by Grandmaster Wignacourt re-affirm the successes attributed to the heavenly intercession of Our Lady. This affirmation was evidenced by the naming of several ships and galleys belonging to the Order to Our Lady. The Order kept the relics of the Saints on public view for veneration and many a visitor described what they witnessed. In 1697, the Russian diplomat and ancestor of the famous Russian writer Tolstoy, Pyotr Tolstoy wrote: “The holy right arm of the Baptist from the elbow to the fingers, is all covered in gold…. And thus I was able to kiss that holy hand.”(1) Tolstoy couldn’t remotely imagine that the relic of Saint John, which he described, would, together with the Icon of Our Lady of Philermos, be translated to Russia. While Tolstoy said these words in Malta, his descendent would write his books in defense of the ‘god of reason,’ as opposed to the Christian God, who was now being set aside in preparation for the Russian Revolution headed by the Bolsheviks. General Napoleon Bonaparte set his eyes upon the Maltese Islands, where the Knights of Saint John lived lavishly, their monastic ways now long forgotten. The Order did not offer much resistance in defense of the Islands and Napoleon conquered it en route towards Ottoman Egypt. The reason for the Knight’s inactivity, was that the Grandmaster wished not rely on his decadent Knights, who had neither the spiritual nor the military power to oppose Napoleon. The Grandmaster reasoned that diplomacy was the solution. Apart from this fact, today the Masonic Grand Lodge of Malta, states that many Knights of the Order of Saint John were in the eighteenth century fellow Brothers of the new Order of Masonry. Therefore, one can easily understand that the annexation of the Order of Saint John from the Islands, came as a chastisement. Similarly to the Templars before them, the Knights of Saint John had now committed public apostasy. In 1798, the French occupied Malta and dispossessed the Order, the last Grandmaster to rule was Ferdinand von Hompesch (1797-1798). On Thursday June 12, 1798, on arriving in Malta upon the Orient, Napoleon was received by the Grandmaster’s carriage. The horses halted mid way towards the palace, a slight earth tremor had scared the beasts. Undeterred, Napoleon made his way on foot through the streets of Valletta. The Grandmaster refused to sign his offer, the French General then ordered all the Knights (including the French) to leave the Island. Grandmaster Hompesch requested General Bonaparte’s permission that together with his Order, he could remove the Icon of Philermos, the relic arm of Saint John the Baptist and a relic of the True Cross. Napoleon granted these concessions on the premise that precious religious objects were to be stripped off their valuable stones, silver and gold. The archives of the Order remained on the island and thankfully, were later saved from the destructive ‘sons of the revolution’ of France. On June 17, 1798, Grandmaster Hompesch left Malta and departed for Trieste, Italy. The Maltese population would later invite the Grandmaster back, however the English prevented such a move. Due to international pressure placed upon Hompesch, by the Czar of Russia and the Austrian Emperor, the Grandmaster abdicated. To the Czar in Russia, Hompesch sent a letter explaining the reasons for abdicating, and a plea for the Czar to protect Christianity. Together with the letter, he sent the Icon of Philermos and the relic arm of Saint John the Baptist. On October 12, 1799, during the reign of Emperor Paul I, the relics were removed to a Russian town of Gatchina. In this manner the Czar was illegally elected Grandmaster of the Order and was in truth never recognized by the Roman Catholic Pontiff. The Czar never became a Roman Cardinal. Grandmaster Von Hompesch left Malta much the same way, Grandmaster Isles Adam had previously left from Rhodes. The main difference though was the following: The Islamists did not deface nor destroy the works of art and belongings, which the Knights had in Rhodes, as did the ‘sons of the revolution’ in Malta. The French intended to eradicate the memory of the Order’s Catholic legacy, destroying many religious artifacts, other artifacts were ‘borrowed’ by the British. Grandmaster Hompesch died on May 12, 1805 in Montpellier, France and is buried in the Church of Saint-Eulalie. The Icon of Our Lady of Philermos therefore, passed into the Russian Imperial collections. The British signed the Treaty of Amiens of 1802, together with the French and Russians, which specifically mentioned the return of the Order to Malta, this treaty was conveniently altogether ignored. Paul I intended to bring the Order back to Malta, however, in September 1800 the British occupied Malta annexing the French. The Maltese invited Britain in and the locals assassinated Napoleon’s General Vaubois. General Napoleon Bonaparte used the Amiens excuse to start his wars against all of Europe. The Russian Emperor thus failed to bring the Order back to Malta, Our Lady of Philermos and Saint John’s relic remained under his care, the care of the Romanov family. Czar Paul I developed a devotion to Our Lady of Philermos and prayed for the intercession of Our Lady against Napoleon. Following his assassination, his son Alexander I was enthroned. Alexander skillfully defeated the Napoleonic French. This historical figure would with time develop a strong bond with Orthodox Christianity and became, as his associates pointed out, ever more ‘holy.’ To this day it is still a mystery whether his funeral was staged. In later years a solitary hermit emerged, recounting details of the Napoleonic campaign that only Alexander I could have known. Czar Alexander II was convinced that Napoleon’s defeat came through the aid of Our Lady when she was particulalry invoked through her many Russian Icons. He publically proclaimed this when he offered all the war trophies and battle banners of the Napoleonic invasion to the Basilica of Our Lady of Kazan as a sign of Our Lady’s victory. The Icon of Our Lady of Philermos remained in the possession of the Russian Romanovs till 1928. Emperor Nicholas II had a particular veneration towards the Icon and had a copy made and kept in his desk. Konstantin Voyenski, who was the former chamberlain to Nicholas II, reported this fact. Voyenski assisted the Emperor in setting up the Military Historical Society and in organizing the celebrations of 1912, dedicated to the centenary of the Russian victory over Napoleon. As the world knows too well, Emperor Nicholas II was together with his family, murdered during the Bolshevik Revolution of Russia. On October 12th of each year, the Icon of Philermos and the relic of Saint John the Baptist were carried in procession and with great pomp, to the Cathedral of Gatchina, Russia, and there exposed for public veneration. October 12 coincides with the Feast of Our Lady of the Pillar and eve to the Catholic Feast of Blessed Gerard and the last Fatima apparition of Our Lady and the miracle of the sun. Following the revolution, the Icon of Our Lady of Philermos was received as a gift by the Karageorgiovich Dynasty of Yugoslavia and in April 1941 it was translated to Saint Peter’s Monastery in Cetinje, Montenegro. Today, the Icon of Our Lady of Philermos can be viewed but not venerated, at the Cetinje Museum in Montenegro, a European region which became an independent state in 2006. Every year on June 24, a procession with a relic of Saint John the Baptist is paraded by the Maltese Bishop along the streets of Valletta and accompanied by representatives of the Knights of the Holy Sepulchre and representatives of the Order of the Blessed Virgin and Saint John the Baptist. One matter is sure, Malta earned its independence in 1964 and later its EU membership and no Nation can lay claim to it. Interestingly, on September 8 1565, the solemnity of Our Lady’s Nativity, the Spanish adventurer and explorer Captain General of the Indies Fleet, Pedro Menendez de Aviles, landed in Florida and proclaimed it Spanish and Catholic territory. On that Saturday, he planted a cross and while singing the hymn ‘Te Deum Laudamus,’ kissed it, naming the new settlement St Augustine 40 years before Jamestown and 50 years before Plymouth Rock. The natives copied and imitated the explorer’s actions. The first shrine dedicated to Our Lady was erected on this very spot and dedicated to ‘Our Lady of Good Delivery.’ It is incredible that on the same day, the good Lord wrought a victory through the mostly Spanish ‘Grand Succor’ in Malta and allowed the formation of the oldest settlement in the USA through the Spanish explorer Pedro Menendez de Aviles. Just remember that Jesus is Lord of all. He will always defend you.